We live in a society where single parenting is becoming more and more common. 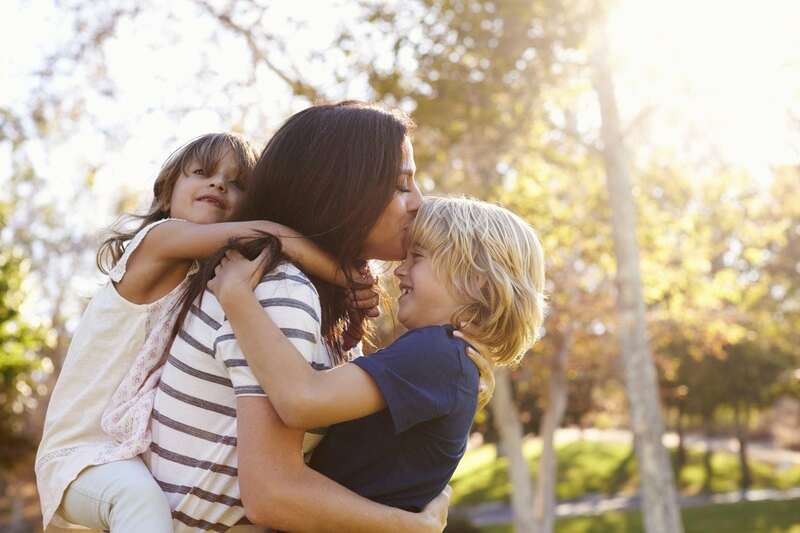 While some parents choose to parent solo, others have been thrust into the situation whether by a separation, divorce, or the death of a spouse. For me, single parenthood became my reality very suddenly when my husband unexpectedly died at 36 years old. Single parenthood was never, ever a lifestyle I expected to face, but here I am. And while I am by no means an expert in this field considering it is a very new way of life for me, there are some things I can say for a fact that have helped me do my best to navigate this strange new world. Back in the good old days, families lived close to one another. Friends became like family. Church was a place that felt like home and your town was a place where everyone knew who you were and what your life was like (whether you liked it or not). Unfortunately, in my opinion, this is no longer the case. Families live scattered all over the globe, friends are hard to come by, church is no more than a quick blip on a Sunday morning (maybe), and towns are large, loud and filled with strangers. No wonder it’s so hard for a single parent to build a community of support! Despite all of this, being a single parent requires the help of a community and it’s up to us to put in the effort to create one. Reach out to trusted family members that live close by. Join a mommy group or a single mommy group (even if it’s just on Facebook for now). join a church and participate in the small group activities. Get to know some neighbors. I know it’s hard to want to put yourself out there and start fostering healthy relationships, but it is necessary. Being a single parent is hard enough on it’s own; doing it alone makes it harder. But you don’t have to do it alone if you carefully build that community around you and your kiddos. This one has been difficult for me, even before I was a single mom. Self-care felt very selfish to me, not to mention a waste of time. Take a bath? There’s laundry to be done! Go get a pedicure? I could use that money on something useful! Have quiet time in the morning? Pfft, I’d rather sleep in! Trust me, I get it. But self-care is much more important than you may think. Having just a tiny bit of time in your day that you can be You: The Individual instead of You: The Mom or You: The Employee or You: The Doer of ALL THE THINGS can make a huge difference in your attitude about life and your attitude toward your children. I find when I’m not feeding Me: The Individual, I get frustrated and short-tempered with my kids much more easily. For me, I try to have at least 15 minutes of quiet time in the morning before my kids come downstairs. I use this time to do my Bible study and pray and sip my coffee while it’s still hot. You may use 15 minutes in the morning to meditate or read a book or listen to a podcast. Whatever it is that will feed You: The Individual is what you should focus on in those first 15 minutes. Then maybe sneak a bath into your evening if you get lucky! There’s only so much one person can do in a day. There’s only so much one parent can take by herself, too. If I think about all the things I have to do all on my own now that my husband is gone, I get very overwhelmed. It’s all just too much! I have had to really discover and set my limits so that I don’t go crazy worrying about all the things. For me, that means I can only do one activity per kid. My daughter does ballet and my son does soccer. It also means I order food more often instead of making homemade meals every night of the week. I ask people for help more than I ever did when my husband was alive. It also means there are some weeks when I will hire the kid down the street to mow my lawn so I can take just one thing off my to-do list. You are a strong, amazing, capable parent and I know you CAN do all the things, but that doesn’t mean you have to or should. There is something to be said for knowing your limits and not pushing yourself past those boundaries. Remember, It’s okay to ask for, and take, help when you need it. It’s okay to say no when you just can’t take anymore. It’s okay to take a break sometimes. You and your kids will be much better off when you know your limits and honor them. Giving yourself grace goes hand in hand with knowing your limits. When you decide that you just can’t handle making dinner tonight, order pizza instead. Then don’t beat yourself up about it. When you yell at your kid for the millionth time that day because you’ve lost all patience, understand that we’ve all been there and that you are not ruining your child. I can’t tell you how many times I’ve cried myself to sleep because I feel like I’m failing my children. But I have to remember to give myself grace. To forgive myself for “failing” again and again. I have to remember to make a choice every morning to do my best. Then to be gentle with myself when I come up short. Parenting is hard work; in fact, I would argue that it’s the hardest job you will ever have. You will not be perfect at it, so stop giving yourself a hard time when you’re not. Just love your kids and do your best. That’s truly all it takes if we would just remember that. Practicing open communication with your kids and with your support system is key to successful single parenting. As much as it is my instinct to hide my grief from my kids after losing their dad, I realized quickly that letting them see my grief was actually a good thing. It helped them to understand their own grief as well as understand that my sadness is so big because my love for their daddy was so big. Instead of pretending that everything is okay, I will now let myself have a cry and explain to the kids that I’m just feeling sad about Daddy. They come over and hug me and reassure me that everything will be okay. Sometimes they will join me and we will all have a good, healing cry together. And then we dry our eyes and get up and keep going. Communication is also key with your support system; you have to be consistent with expressing what you need and what your expectations are: “I need you to watch my son from 10-2 today and he really needs to have a nap after lunch.” No one can read your mind and no one but you knows exactly what you need. There are people out there who want to help you, but if you don’t communicate your needs (and swallow your pride and ask for help), they can’t do much for you. Just be open, honest, and clearly communicate with your kids and your community. So you can all work together to get your family what it needs. Single parenting is a tough job. I’m sure I’m just scratching the surface of all the challenges it will bring (I don’t even want to think about my kids being teenagers!). But this is the hand that I’ve been dealt and I am determined to do right by my kids without sacrificing my sanity. I am hopeful that these tips (and praying a lot!) will help me navigate this unexpected journey that I am on. Just remember, mamas, you are doing a good job and you are ENOUGH for your kids. You are exactly what they need. Don’t let anyone tell you different!